Ultrasound scan of a pregnant woman and (insert) ultrasound image of fetus. Source: Health Diagnostics. Ultrasound scanning is a diagnostic technique in which very high frequency sound waves (inaudible to the human ear) are passed into the body, and the reflected echoes are detected and analyzed to build a picture of the internal organs or of a fetus in the uterus. The procedure is painless and considered safe. Also called sonography, ultrasound scanning was originally a spin-off from naval sonar (used to detect submarines in World War II) and was first used medicinally in the 1950s. The original ultrasound scanners produced still images; most modern scanners produced moving pictures, which are easier to interpret. Ultrasound waves are emitted by a device called a transducer, which is placed on the skin over the part of the body to be viewed. The transducer contains a crystal that converts an electric current into sound waves. The waves used have frequencies in the range of 1 to 15 million hertz. At these high frequencies, the waves can be focused into a fine parallel beam, which passes through a "slice" of the body if the transducer crystal is made to oscillate back and forth. Some of the waves are reflected at tissue boundaries, so a series of echoes is returned. The transducer also acts as a receiver, converting these echoes into electrical signals, which are processed and displayed on a screen to give a two-dimensional image of the scanned body slice. By moving the transducer, different slices through the body can be seen. Ultrasound waves pass readily through soft tissues and fluids, making this procedure particularly useful for examining fluid-filled organs (such as the uterus in pregnancy, and the gallbladder) and soft organs (such as the liver). Ultrasound waves cannot, however, pass through bone or gas. They are thus of limited use for examining regions that are surrounded by bone (such as the adult brain) or that contain gas (such as the lungs or intestines). One of the most common uses of ultrasound is to view the uterus and fetus in pregnancy. 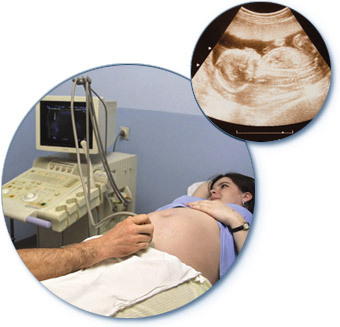 Ultrasound is often performed about 16 to 18 weeks into the pregnancy, but may be performed at any stage. If the date of conception is known, the scan shows whether the fetus is of the expected size; conversely, fetal size can help establish the accurate date of conception and therefore predict the expected date of delivery. The scan also reveals whether there is a multiple pregnancy. It is also possible to identify certain gross abnormalities, such anencephaly or spina bifida. Congenital heart disease can sometimes be detected, enabling the baby to be delivered in a hospital that specializes in correcting such defects soon after birth. The scan also shows the position of the placenta. If the placenta is in a position that could obstruct normal childbirth (a condition known as placenta praevia), delivery by cesarian section may be necessary. Scans earlier in pregnancy may be performed if the doctor suspects an ectopic pregnancy (presence of an embryo outside the uterus), hydatidiform mole (abnormal tumor in the uterus), impending miscarriage, or early death of the fetus. Ultrasound is also vital for the procedure of amniocentesis and is used during chorionic villus. A scan shows the position of the fetus and placenta before either of these procedures and also helps in guiding the needle into the uterus. Later in pregnancy, a scan may be carried out if the growth rate of the fetus seems slow, if fetal movements cease or are excessive, or if the mother experiences vaginal bleeding. For high-risk or overdue pregnancies, a scan may be carried out before delivery to check on fetal size, development, and position in the uterus, the amount of amniotic fluid, and to recheck the position of the placenta. In the newborn child, ultrasound can be used to scan the brain, via a gap (the anterior fontanelle) in the skull, to investigate hydrocephalus or to diagnose a brain tumor or brain hemorrhage. Echocardiography is a type of ultrasound technique used to look at the heart. The technique is particularly useful for investigating congenital heart disease and disorders of the heart valves. See also carotid ultrasound. The liver can be clearly viewed by ultrasound, which can be used to diagnose liver disorders such as cirrhosis, cysts, abscesses, or tumors. Ultrasound shows the presence of gallstones in the gallbladder or bile ducts. In a patient with jaundice, a scan can help establish whether the jaundice is due to obstruction of the bile ducts or to liver disease. The pancreas can be scanned for cysts, tumors, or pancreatitis, and the kidneys for congenital defects, cysts, tumors, and hydronephrosis (swelling due to obstruction in the outflow of urine). Other organs that may be scanned by ultrasound for diagnostic purposes (primarily to look for cysts, solid tumors, or foreign bodies) include the thyroid gland, breasts, bladder, testes, ovaries, spleen, and eyes. Ultrasound scanning is also used during needle biopsy (insertion of a very thin needle into an organ to remove cells, tissue, or fluid for examination) to help guide the needle accurately to a specific spot. Doppler ultrasound is a modified form of ultrasound that exploits the Doppler effect to investigate moving objects. One important use of Doppler ultrasound is to examine the fetal heartbeat. Doppler ultrasound is also used in the technique, sometimes called angiodynography, by which information can be obtained about the rate of blood flow through blood vessels. This procedure enables the doctor to detect narrowing of vessels or turbulence in the flow of blood. For a scan in early pregnancy, the woman is usually asked not to pass urine for a few hours beforehand; a full bladder helps improve the view of the uterus by displacing nearby loops of intestine. For a liver or gallbladder scan, the patient is usually ask to fast for several hours beforehand. Clothing over the region to be scanned is removed, and oil or jelly is smeared over the skin to achieve good contact when the transducer is passed back and forth over the scan. During the scan, which takes about 15 minutes (or sometimes less), the patient can usually lie back and watch the images appearing on the screen. The ultrasonic waves produce no detectable sensation. When a scan is performed in conjunction with a technique involving insertion of a needle, a local anesthetic is used and there is usually little or no discomfort.